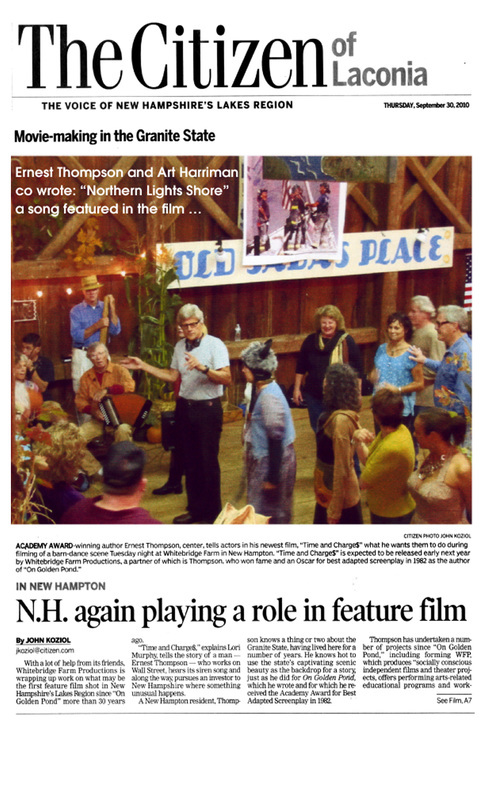 With a lot of help from its friends, Whitebridge Farm Productions is wrapping up work on what may be the first feature film shot in New Hampshire's Lakes Region since "On Golden Pond" more than 30 years ago. "Time and Charges," explains Lori Murphy, tell the story of a man - Ernest Thompson - who works on Wall Street hears its siren song and along the way, pursues an investor to New Hampshire where something unusual happens. A New Hampton resident, Thompson knows a thing or two about the Granite State, having lived here for a number of years. He know how to use the state's captivating scenic beauty as the backdrop for a story just as he did for On Golden Pond, which he wrote and for which he received the Academy Award for Best Adapted Screenplay in 1982.